Country or classic — All you have to do is select from several design options to create the round birdhouse of your dreams. When you first look at this birdhouse, you might think it’s a turning project. How else but on a lathe could you make Round Bird House? 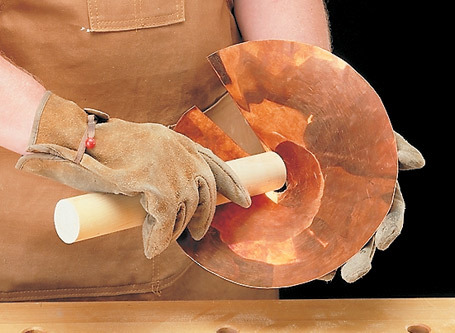 Well believe it or not, you don’t need a lathe to build this project. Instead, the cylinder is assembled from a number of narrow strips. Each strip is beveled on both sides. Then the strips are laid side-by-side and “rolled” into a circle. Don’t worry though — it’s not a complicated process. 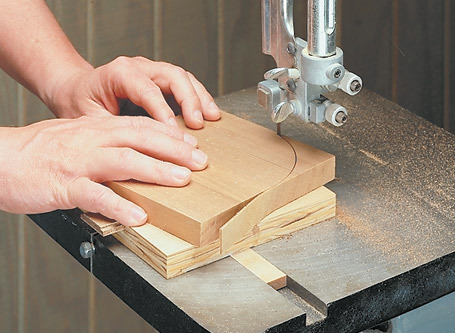 Aside from the shape of the round birdhouse, one of the neat things about this project are all the options that are available when building it. Take the roof for example. 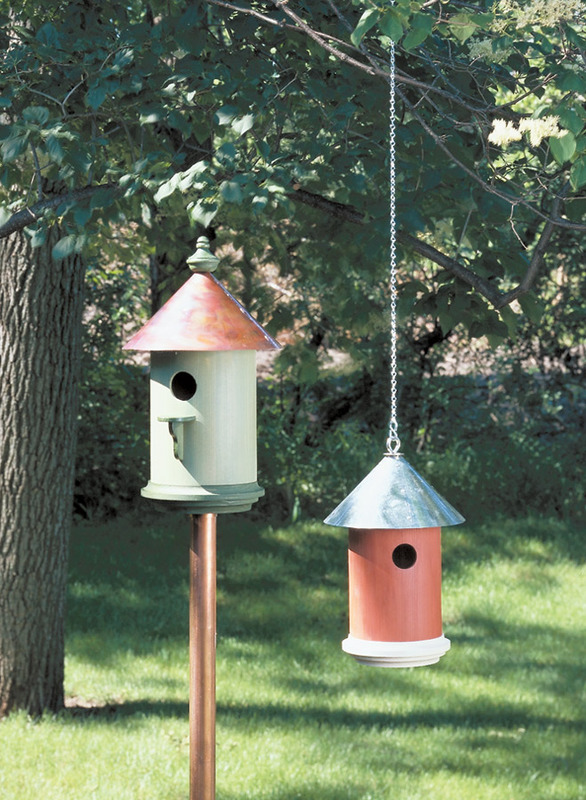 We built one birdhouse with a galvanized sheet metal roof and another with a copper roof. Either way, you’ll get the opportunity to try something a little different — working with sheet metal. And you won’t need any special equipment other than a pair of tin snips. Note: After your purchase, you will receive an email containing a PDF attachment of your purchased plan, as well as instructions for logging in to download the plan and access any other associated files and videos, which will all be located on this page. 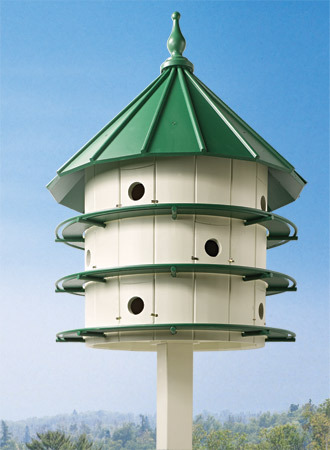 Coopered construction and durable materials combine to create an eye-catching home for these social birds. The United States Customary System of Units (USCS or USC), more commonly referred to as the English or Imperial system, is the standard set of units for our plans. It uses inches and feet for measurement. This is the one you probably want if you are in the United States, and it is the one we have traditionally offered on this website. The International System of Units (SI), more commonly referred to as the metric system, is the alternative set of units that we have available for some of our plans. It uses millimeters, centimeters, and meters for measurement. This is the one you probably want if you are outside the United States. These plans are provided by our business partner, Australian Woodsmith, and are based on the original Woodsmith plan. However, dimensions and other elements of the plan may vary between the metric and standard versions. Be sure to double-check the plan before building. All of the information that you need to build our plans can be found in the standard plan. However, if you want even more granular detail to make your job easier, you should consider our premium plans. These come with additional shop diagrams that we drew when creating the prototypes. Shop drawings are not available for every plan.